In the year 1992, the planet Nemesis returns to pass near Earth on its 170 million year orbit. Two adult astronauts and two child astronauts are sent to explore the planet in a space shuttle. Once on the planet, the two adult astronauts make a discovery, a large round man made structure approximately a metre and half in diameter. Unbeknownst to the astronauts sealed inside the structure is the evil witch Bandora (played by Machiko Soga) and her small band of minions. Sealed by five ancient human tribes, with the help of their of the Guardian Beasts, Bandora has been imprisoned for 170 million years (the last time Nemesis was near Earth) in a time when human tribes coexisted dinosaurs. With Bandora free, she and her minions thank the astronauts who accidently freed them by blasting them away and abducting the children and the space shuttle. Bandora arrives back on Earth with a crashing thud, appropriating a skyscraper as a base for her palace which sits atop. There she threatens humanity with destruction. However in a nearby apartment complex, an elderly man who is the manager of the apartments, is actually a wizard named Barza (Jun Tatara) in disguise. He is Bandora’s arch enemy and has been lying in wait just in case she returned. Hidden below the apartments, some 2,000 meters below lies five holy warriors in hibernation, the Zyurangers. After some trouble in trying to resurrect the members, the entire team; Yamato Tribe Prince Geki (Yuuta Mochizuki), Sharma Tribe Knight Goushi (Seiju Umon), Etoffe Tribe Knight Dan (Hideki Fujiwara), Dime Tribe Knight Boi (Takumi Hashimoto) and Lithia Tribe Princess Mei (Reiko Chiba) fight Bandora and her minions and eventually manage to save the children trapped inside the space shuttle which Bandora has shrunk. Bandora and her massive palace retreat to the moon where she launch various attacks against the Earth, in particular ones that involve harming children (“I hate children!” she gleefully cries). Most of the time the attacks involve sending various Dora monsters, which are evolved from golems created out of clay by her offsider leprechaun craftsman Pleprechuan. Occasionally she will also send out Grifforzar, a lion faced griffin creature to stop Zyuranger from foiling their plans. Lamy (Ami Kawai), Grifforzar’s wife, later shows up and can turn into a giant scorpion creature in order to attack Zyuranger. Rounding out Bandora’s minions are Totpat and Bookback who are nothing more than comic relief bumbling henchmen. Of course Zyuranger has a number of items at their disposal to fight back against Bandora. The main one is the Dino Buckler so that the five of them can transform into Tyranno Ranger (Geki), Mammoth Ranger (Goushi), Tricera Ranger (Dan), Tiger Ranger (Boi) and Ptera Ranger (Mei). Over the course of the show they obtain special hand weapons and the Guardian Beasts return. These are essentially giant robotic animals; Tyrannosaurus, ZyuMammoth, Triceratops, SaberTiger and Pteranodon, who can also combine to form a larger robot called Daizyuzin and variants with other Guardian Beasts who make latter appearances. About a quarter way through the series, team leader Geki’s older brother, Burai, the Dragon Ranger is resurrected. Due to grievances from 170 million years ago, jealousy and vengeance cloud Burai’s feelings towards Geki. Burai aligns himself initially with Bandora but comes disillusioned and forgives Geki after he is confronted by a small childlike figure in white robes who relays a shocking truth to him. Zyuranger along with Burai fight Bandora together with his guardian beast Dragon Caesar, but a tragedy will soon strike down Zyuranger. Yes, this is the show used as a basis for the very first “Mighty Morphin' Power Rangers” which was broadcast just about everywhere from 1993 onwards. While I was aware of the “Power Rangers” phenomenon in the 1990’s, I have never really followed any TV tokusatsu. I did take a mild interest in all things tokusatsu in the late 1990’s, but unlike anime at the time, the fandom was miniscule and finding like minded people or resources on it was incredibly difficult. Plus actually acquiring it, in English (and not in terrible condescending English edited dubs) was pretty much impossible. Today it’s still quite difficult. You could count the amount of English subbed releases of tokusastu TV shows on two hands, and that’s over the course the last decade. I suppose the problem is that the material does itself no favours in terms of engaging with an English language fandom, especially when compared with anime. I mean it is made for children in order to sell tons of toys. “Zyuranger” is no different. Super Sentai (of which “Zyuranger” is the 16th of this series) by this point was a well oiled machine. It’s pretty much the same formula each year, juts a new cast and new mecha. Watching this show as an adult, it does become obvious that the selling point is the mecha (guardian beasts), monsters and the fights. Zero time is dedicated to fleshing out the main cast. The actors playing the five Zyurangers are pretty wooden most of the time, but then again they don’t really have anything to play off of as the dialogue is pretty bog standard and aimed at children. As you’d expect in a show like this, there are plenty of kids in the show (almost entirely in one off roles). Unfortunately most couldn’t act their way out of a pre-torn wet paper bag. Worse is the fact that even when consider these types of shows are solely dedicated to sell toys to children, some of the robots and the various combinations of them are as ugly as sin. The worst example is the final combination of all the robots in the show, including the almost never used brontosaurus robot. The resulting robot, a combination of the three main robots, looks utterly absurd and barely moves in action scenes. This segues into the other big problem; especially in the first half of the show is a fair wack of the effects are kind of rubbish and cheap looking. One commonly used effect is the use of forced perspective. For example if the crew want to show a giant monster fighting the Zyurangers, they’ll shoot it from a cherry picker with the guy in the monster suit close to the camera, and the Zyuranger actors on the ground in the distance. It sort of works and there’s no need for a blue screen shot. However it doesn’t work at all when doing the same thing at ground level trying to create the illusion of a monster trying to stomp on the Zyurangers as the real distance and scale is quite apparent. However a lot of the cheapness (and there’s some REALLY cheap looking monsters early on in the show) disappears for the most part a little before the half way mark. It’s as if the budget was upped a little mid way though the show. Although the actors playing the Zyurangers are a little wooden, not every actor is. Machiko Soga who plays Bandora who steals the show. The child hating witch has some great lines and Soga hams it up brilliantly. She’s everything a villain should be in a kids show and more. Apart from the action sequences, the humour of the show is also one of the great aspects of “Zyuranger”. Certainly a lot of the humour and tone of the show is childish, but the absurdity of it (and staff are absolutely aware of this and play it up) and slapstick do make it a joy to watch. It does get a bit more serious half way though, but the writers always make sure the overall tone is light hearted, most of the time. Another surprising thing about the show was how emotional the climax was. I won’t give away what happens, but it does humanise Bandora and makes the audience far more empathetic towards her cause. The tone of the show also veers from childish playfulness to strange creepiness and back. For example Burai is practically abducted and harassed by a small creepy child in white make up and robes who is for all intents and purposes death itself. The other thing which struck me is the seemingly dangerous situations that the child actors in particular seem to be placed in on set. Especially in early episodes we see children hovering from great heights in the air (hanging from wires obviously) and explosions galore. Sure, it was over 20 years ago, but one wonders what these kid’s parents were thinking and how the producers got away with some of this stuff. Shout! Factory have done a decent job on the set. I would have liked some liner notes, and there is an episode which could have has some additional subtitles to convey the meaning of a some Japanese puns, but all in all I had no real problems with how things were handled. For a show like this, you’d expect pretty much no special features. However I was really surprised to find one extra on the disc; “Power Progenitors: Super Sentai Zyuranger Power Morphicon 2014 Panel”. Not knowing exactly what it was, I rather cynically thought it’d be some woefully mediocre panel with Shout! Factory staff ignorantly crapping on about the show. In fact it turned out to be a panel from a biannual Power Ranger convention and featured three Japanese guests; Yuuta Mochizuki who played Geki, stuntman Hiroshi Maeda who played suited up as Tyranno Ranger and a second stuntman, Yasuhiro Takeuchi, who suited up as Dragon Ranger. The panel is entertaining on many levels. Not only do we learn quite a lot about the shows and actors/stuntmen (for instance Mochizuki is also a stuntman, did all of his own stunts on the show and it is customary if you’re acting in a sentai show as Mochizuki did, to don the ranger outfit for at least the final episode), but watching the gaffes misunderstandings and mistranslations as the panel progresses is hilarious, especially with the subtitles put in after the fact. Mochizuki and Maeda have a habit of half saying things in English and Japanese in the one sentence (Maeda also appeared in various Power Rangers series made in the US and New Zealand) and combined with the translator who looked a little ill, well the outcomes at times looked to be confusing for both the panel and the attendees. All in all, this is a pretty good set and the show itself is decent for what it is; a children’s show. The absurdity and humour as well as the action do make up for a lot of the silliness. 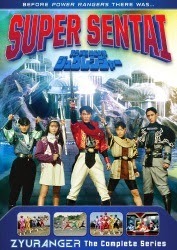 The final episode in the set promotes the next sentai series which followed this show; “Dairanger”. It’s a terrible tease and I really do hope that Shout! Factory release it as well, but somehow I doubt they will. 6.5 out of 10. Remaining Backlog: Nine series, two movies, also waiting for second parts for two shows to be released before viewing them.